If you want to do this, you need to know your key signatures. Good news. It’s not that complicated. Take a look at the image below. Notice how, as you go clockwise around the circle (starting on C), you gain one sharp every time you change letters. The key of C has no accidentals (sharps and flats); the next letter/key – G – has 1 sharp; the next letter (key of D) has 2 sharps, etc. Go counter-clockwise and you gain a flat every time you move. 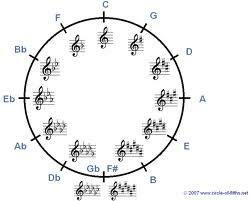 Start on E, take the 1, the 3, and the 5, and you get an E major chord – E G# B. Now make five E major chords. Now move between them. Now move between them and the C major chords you made. This is a lot of work, I know. But worth it.